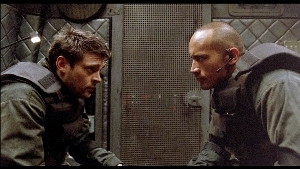 Cast: The Rock, Rosamund Pike, Karl Urban, Dexter Fletcher, Deobia Oparei, Ben Daniels, Al Weaver. Directed by Andrzej Bartkowiak, loosely adapted from the Doom video game. Story: A team of marines investigate strange goings-on in a lab on a deserted planet. Doom. The movie of the video game. Expectations don't come much lower than that. What a surprise then, that it's only moderately crap and has a cracking final reel. Doom, for the video game virgins among you, was a trailblazing video game in which the player sees through the eyes of a lone marine as he wanders through a futuristic facility, shooting the hell out of anything that moves. True to form, the movie adaptation is pretty mindless, centering on the bang bang with a barely plausible plot that we're not supposed to think about. CGI is used to good and extensive effect, mostly in the hacky-slashy arena but also with some degree of innovation, for example when we see John Grimm's eye view of him walking up to his own reflection, with no visible camera. This leads into a fantastic first-person sequence that is so much like the video game that it had me chuckling with delight several times. Once this five-minute rampage is over, we're led into the climax of the movie, which is unexpected and handled very well - with the exception of the appalling wire work that somehow still manages to find its way into otherwise visually excellent movies. Oh, and the BFG is present - which will put a smile on your face if you've played the game! The Rock (Welcome to the Jungle, The Scorpion King) was excellent in Be Cool and delivers another performance far better than you would expect from a WWF star. 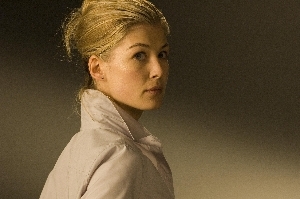 Karl Urban (the baddie from The Bourne Supremacy) impresses as moody marine John Grimm and Rosamund Pike makes the best of a thinly written part. Dexter Fletcher has got a lot better at his American accent since Press Gang - his part is an ambiguous and underused one that suggests there was another story thread that may have been lost on the cutting room floor. This may have been wise - the length is about right but it couldn't support another 15 minutes - in fact there's plenty in the first hour that could have been cut to help with the nod-off factor. In all, Doom is still the dumb shooty movie we were expecting, but the second half makes it worth the effort of sitting through the very stale beginning. Not the best of the genre, but not as bad as I was expecting either. Testosterone Satisfaction Rating: 3/5 - More violence than you can shake a chainsaw at. To enjoy this film you should be: up for some mindless bloodletting. Doom is on general release in the UK now.